Synette Tom, Founder & CEO. Synette Tom always wanted to start her own business. She is an entrepreneur and self starter to the core. She never suspected, however, that it would involve developing GPS tracking service for dogs and cats. Nonetheless, her education as an electrical and electronics engineer, her experience as a designer of communication satellite systems and business development director in the space industry, and her childhood with a variety of pets on country side of Oahu, Hawaii set her up well to create Gibi and make it a reality to help pet parents keep their pets safe. 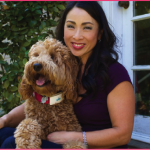 Fortunately, Synette’s Labradoodle, Kalé, has never been lost, but the entrepreneur has seen firsthand what pet parents go through when their dogs wander – or run – off. Now she has done something about it. Sheree Loui, Founder & Board Member. While raising 5 children, it came natural for Sheree to puppy raise and train medical service dogs for Hawaii Fido for many years. The children understand the command “leave it” just as well as the dogs. Sheree finds puppy-raising/training so rewarding when the dog works with a wounded warrior or a disabled person. She says, “it’s worthwhile to see dogs help their human best friends open doors, bring medications, and more.” She is also a board member of Hawaii Fido, a non-profit organization certified to train medical service dogs for people with disabilities. Community service is a must to Sheree. She has provided many volunteer hours to local public and private institutions, including the American Cancer Society and the Susan G. Komen Foundation in hope there will be a cure for all cancer someday. Where did the name “Gibi” come from? 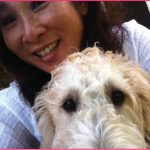 When we were thinking about the name for our company, Sheree was training a service dog named Gibbs for Hawaii Fido. 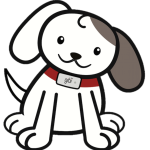 Gibbs learned basic obedience quickly, but had a special talent…pulling the socks off of Sheree’s five children when they came home from school. Encouraging his new talent, Gibbs gently nibbled the socks from either the hard heels or the tickly toes and eventually pulled the sock completely off the foot. With sock in mouth, Gibbs was taught to put those stinky and dirty socks straight into the laundry basket. Who would have known this would be an essential and important talent. Gibbs was also called Gibby by Sheree’s children. When Synette heard that, she really liked the sound. After Googling it, she found that gibi means gigabyte, which is one billion bytes. That’s the story behind the Gibi name. 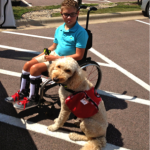 Gibbs became a certified medical service dog and placed with Brendan, a boy with cerebral palsy. Gibbs’ talent is handy in helping Brendan with his clothes as well as passing him his dropped toys, guiding him on his daily routes, opening doors, pushing buttons, and just being his best friend.